Here is a chance to win a free copy of "The Ultimate Consumer's Guide To Wind Power: 2010 Edition" (a value of $19.95)! 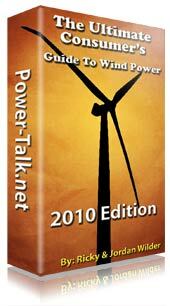 To be entered into the drawing, simply tell us how Power-Talk.net has been helpful in your renewable energy research. The contest ends March 6th 2010 and a winner will be randomly drawn. The winner will instantly receive the free eBook and be posted in the following "Power Report" Other testimonials will also be published on power-talk.net as well. Well, what are you waiting for? Go tell your friends and family! Remember, to be eligible to win you need to be signed up for our newsletter. I have also added a chart on the Power Talk homepage that shows our monthly renewable energy production. As you can see our wind has been fairly consistent and solar input is slowly creeping up. I think for the February chart I will add the generator run time to make it a little more interesting! 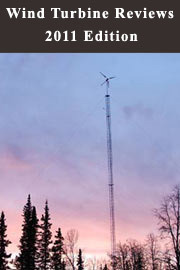 The 2010 Wind Turbine Reviews eBook is now finished and available! It not only includes reviews, but also the in-depth analysis of different turbine designs. I specifically made this eBook for all of you that purchased "The Ultimate Consumer's Guide To Wind Power" last year and just want the 2010 turbine reviews without paying the full price. This eBook is also perfect if you already have a wind system in place but are shopping for a new turbine.